Football is a game that takes time to learn in order to develop key skills and progress. When starting to play from a young age, it is important to experience the fun aspect of football while learning the ropes and improving skills. Achieving this balance will help children develop a genuine passion for the game. The best way to achieve this balance involves finding creative ways to incorporate technical aspects of football into a fun-filled game. We have chosen a handful of useful games which we believe will help to develop skills while incorporating an element of fun. Listed below are our top 3 football games for kids. Walking the dog is a game designed to introduce dribbling and ball control to younger players. It also focuses on the important skill of maintaining spatial awareness. To set up this game, first, scatter flat markers of the same colour. Then, in between these, add a few more cones of another colour. The players should dribble around with the ball (their dog) stopping at every lamppost they meet (white cones shown in the diagram below). 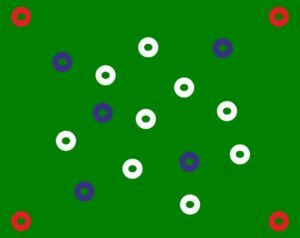 The coach should then say ‘it’s raining’, and then the players must make their way to a tree (blue cones shown in the diagram below) to take shelter. Vary the game by asking the players to dribble with either feet or their weaker foot. Asking them to dribble to the most lampposts in a limited about of seconds, and other small challenges will also help progress their dribbling skills. This game is used to help improve passing accuracy and develop first touch control. The general concept of this game is that players must get into pairs, one person being the receiver and the other being the server. The server will play the ball into the receiver who should be standing opposite. The receiver then passes the ball back to the server and runs backwards around a cone, and then back to his original position to receive the next pass. This can be done 10-20 times. Ask the receiver and the server to swap positions, and repeat the game. The game can be varied by changing the way the ball is received. For example, bounce the ball once to increase the difficulty of the first touch. This game is designed to improve agility, speed, and finishing, as well as skill on the ball. To begin, split your players into two even teams. Line the twoteams up behind the corner flags and place two training poles opposite the goal, roughly one meter apart. 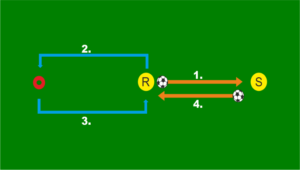 On the word ‘go’, a player from either team must run from their corner, around their poles and then to the ball waiting in the centre. Both players are competing to score in the goal. You can use a point system to make this game more competitive. Or to increase the difficulty of the game, add a defender to make it harder for the players to score. These are just a few of the games you can use to help your players develop. For more football games for kids, check out Teach PE. This site is an excellent source which has games to cover a whole range of skill areas. Additionally, if you have any ideas of your own, why not share them with us on Twitter or Facebook?